Home - Viking Construction Services, Inc. Welcome to Viking Construction Services! Viking Construction is a fully-licensed and insured home builder and full-service remodeling contractor for the New Orleans, Metairie, Kenner metropolitan area. Working in and around New Orleans, we know that building a new home, remodeling all or part of a home, and even the light commercial projects we undertake, can face unique challenges in the climate of South Louisiana. The contractors at Viking Construction are well versed in how to prepare for these construction issues as well as the many other unforeseen obstacles that can occur during a home remodel or custom build. Our goal is to provide you with the best solution to the problem you are facing, whether that is a small kitchen, the need for an addition, or a newly constructed house. We are also Certified Aging in Place specialists, helping you remain in your home for as long as possible. However we can make your home more livable or your life more enjoyable, Viking Construction Services will turn your dreams into reality. Talk to us today about your custom home or remodeling needs. Building a custom home, or any construction project requiring a contractor, is a substantial undertaking. You want a contractor that provides the quality, craftsmanship, and service that is now considered a thing of the past. With Viking Construction Services, you can feel confident we will provide these qualities, while remaining completely in line with your vision and budget. Let us prove it! We are remodeling experts with knowledge of all the local codes and special requirements, so whether you’re repairing storm damage, updating your kitchen, or putting an addition on your home, you can rely on Viking Construction Services to deliver the highest quality remodeling services at a very reasonable price. We’ve seen it all, and done it all. No renovation project is too large or small. A unique specialty of Viking Construction Services is building and remodeling camps for the Louisiana Sportsman. Whether you have a passion for the water, you love hunting or would just like a camp to call your own, we can design and build the perfect retreat. When you need retail, office or storage space in the greater New Orleans area, Viking Construction Services has trained and licensed contractors who can build out any commercial property and equip it to meet your business needs. As Certified Aging in Place Specialists, we at VCS Inc. are very proud of our pro bono work in our community. 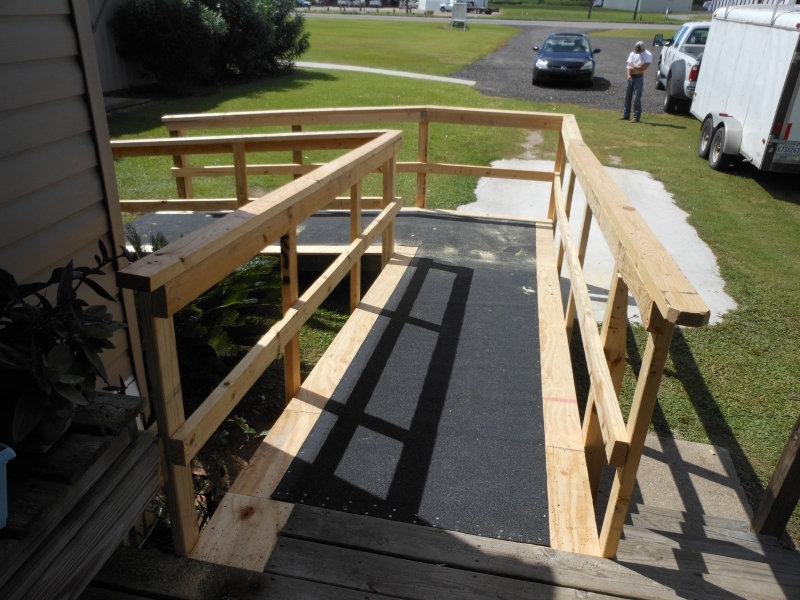 VCS Inc. partners with the following nonprofit organizations: First Baptist Church of Venice, Trinity Methodist Church, Boothville- Venice Volunteer Fire Department and community volunteers to construct handicap ramps for those who are in need and cannot purchase these services themselves. Often these ramps are constructed with new or “left over” materials supplied by anonymous donors from our community. VCS Inc. partners only with the named nonprofits. VCS Inc. endeavors to build a minimum of one and a maximum of two ramps a year. VCS Inc. cannot entertain requests for these services from the general public. Post Katrina, he did a condo renovation for my wife and I. He did exceptional work at a very fair price and was very easy to work with and just a pleasure to do business with. I’ve used him for years, he’s excellent. Copyright © 2017 Viking Construction Services, Inc.